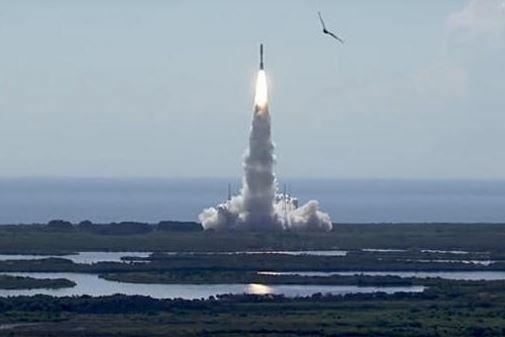 A powerful United Launch Alliance Atlas 5 rocket thundered away from Cape Canaveral Saturday evening, putting on a spectacular weekend show for area residents and tourists as it boosted a multi-satellite military payload into space. 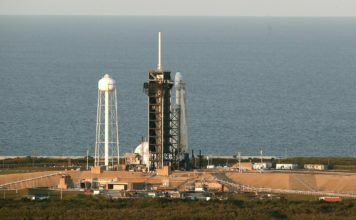 Taking advantage of near-ideal weather, the rocket’s Russian-built RD-180 first stage engine roared to life at 7:13 p.m. ET, followed moments later by ignition of five strap-on solid-fuel boosters, almost instantly pushing the 20-story rocket skyward. Mounted in the rocket’s nose cone were a military communications support satellite and another experimental spacecraft carrying multiple experiments, including a free-flying sub-satellite named Mycroft, presumably after Sherlock Holmes’ older brother. All three were bound for a high orbit near the region where military and commercial communications satellites operate 22,300 miles above the equator. Generating a combined 2.6 million pounds of thrust, the Atlas 5’s workhorse Russian engine and the five strap-ons majestically pushed the rocket away from pad 41 at the Cape Canaveral Air Force Station, leaving a churning cloud of exhaust and a crackling roar in its wake. The initial moments of the flight appeared to go smoothly as the towering rocket knifed through the sound barrier and shot away through the early evening sky, arcing away to the east above the Atlantic Ocean. The strap-on boosters fell away about a minute and 50 seconds into flight and the RD-180 shut down two minutes and 45 seconds later, after boosting the vehicle out of the thick lower atmosphere. The rocket’s Centaur second stage’s hydrogen-fueled Aerojet Rocketdyne RL10C-1 engine ignited a few moments later. ULA ended it’s launch broadcast at that point and no additional details about the booster’s performance were released. Three Centaur firings were required to put the satellite payload into its planned orbit. An initial firing was planned to put the spacecraft into a preliminary “parking” orbit. A second five-minute 50-second burn was designed to put the payload into an elliptical orbit with a high point of around 28,200 miles. A third Centaur firing five-hours after launch was planned to circularize the orbit. The spacecraft — the Continuous Broadband Augmented SATCOM, or CBAS, and another known as EAGLE — were to be released to fly on their own in a circular orbit slightly above the 22,300-mile-high geostationary orbits used by military and civilian communications satellites. CBAS, the upper satellite, is “a military satellite communications spacecraft destined for geosynchronous orbit to provide communications relay capabilities to support senior leaders and combatant commanders, the Air Force said in a statement. “CBAS will augment existing military satellite communications capabilities and broadcast military data continuously through space-based, satellite communications relay links,” the Air Force said. The lower satellite in the Atlas nose cone featured one of the more convoluted names used by the Pentagon, the “Evolved Expendable Launch Vehicle Secondary Payload Adapter Augmented Geosynchronous Laboratory Experiment,” or EAGLE. Built by Orbital ATK and managed by the Air Force Research Laboratory, EAGLE is designed to demonstrate a “space vehicle design which allows six or more deployable or hosted spacecraft in geosynchronous orbit,” according to an Air Force Fact sheet. One of EAGLE’s experiments is a sub-satellite known at Mycroft, also built by Orbital ATK, that was intended to test space situational awareness technology, or SSA. 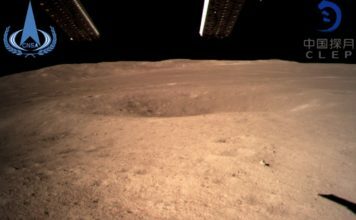 The fact sheet said the EAGLE satellite also carries sensors and experiments to “detect, identify and analyze system threats such as man-made disturbances, space weather events or collisions with small meteorites.